The Consumer Product Safety Commission (CPSC) has published a Final Rule in the Federal Register exempting engineered wood products from third party lead, ASTM F963 heavy metals, and phthalates testing. This determination was first suggested in a CPSC Staff Briefing Package (PDF) on August 29, 2012. euroSource and the Handmade Toy Alliance listed this determination among our priorities in a follow-up document on September 13, 2012. euroSource continued to push for this determination including in comments to the CPSC regarding reducing regulatory burdens as recently as September 2017. So it is with pleasure, and relief, that we greet this news after nearly six years! 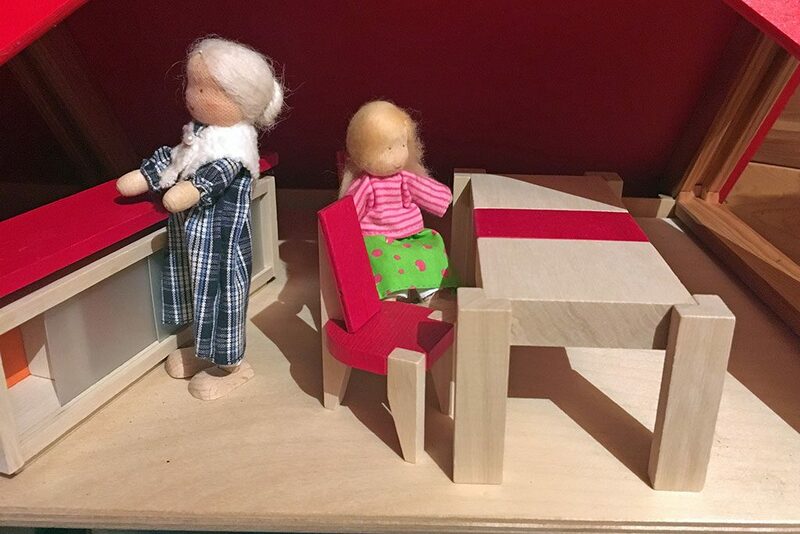 A third party testing determination now includes manufactured (or engineered) woods like plywood commonly used in wooden toys like the dollhouse shown here. Combined with previous determinations for solid trunk wood, cotton and other fabrics, and the component parts rule, manufacturers of wooden toys have a much easier and lower cost route to compliance. Certain engineered wood (EW) products no longer need third party testing for lead, ASTM F963 heavy metals, and phthalates requirements since it has been determined that they do not include the elements. (For hardwood plywood, PVAc adhesives cannot be used.) The engineered wood must be unfinished and untreated and composed of virgin wood or pre-consumer waste. The EW products included in the final rule are: particleboard, hardwood plywood, and medium-density fiberboard. A manufacturer must continue to provide a certificate for the finished good. What is Unfinished and Untreated? Unfinished and untreated means that the EW has no surface treatments or finishes like paint, flame retardants, other surface coatings, or metal object like nails or screws. What is Virgin and Pre-consumer Waste Wood? Virgin wood is wood that has not been recycled from a previous use like logs and wood chips. Pre-consumer waste wood is recycled wood that has never reached the consumer like trimmed waste from a manufacturing process or sawdust from cutting virgin wood. The determination is effective on July 23, 2018. The EW products determination can be paired with the trunk wood determination, and other natural material determinations to significantly reduce the amount of third party testing required to generate a valid certificate. In July of 2015, the CPSC published the solid trunk wood determination in the Federal Register. The rule took effect September 15 2015. Similar to the EW determination, this one includes unfinished and untreated wood. The determination specifies that trunk wood does not contain heavy elements exceeding the limits of ASTM F963. Based on this determination, this unfinished and untreated wood in toys does not require third party testing. Refer to the document linked above for a more detailed list and treatment of this determination. There is also a recently issued phthalate determination that covers certain plastics used in children’s products. Plastics are less frequently used in smaller batch toys made in Europe, but this determination can also be used to reduce the burden of third party testing when plastic parts such as buttons, bushings, or other accoutrement are used. Determinations nearly always must be paired with the component parts rule to take advantage of reduced testing cost. The process becomes one of assuring that no components of a manufactured children’s product contain lead, other heavy elements or phthalates and therefore the finished good cannot contain them either. Then there is the possibility that only mechanical testing is required. If for instance you produce a wooden toy that only includes; solid wood, manufactured wood, glue, and a couple surface colors, then only the glue and surface colors must be third party tested for lead and other heavy metals or phthalates. Making use of the component part rule, your glue and surface coating are tested by batch before they enter your factory and thus this single test can cover multiple products or manufacturing runs of the same product. So it is possible that only ASTM F963 mechanical tests need to be performed on your finished toy by a third party testing laboratory. Please contact us if you need assistance in understanding the United States toy safety rules and directives or you’d like advice on applying these determinations to reduce your third party testing costs. euroSource also provides training in a corporate setting for your business.